A new poll suggests that Canadians are deeply concerned about the loss of bees, with nine out 10 blaming pesticides for the sudden bee die-off. The survey was conducted for Friends of the Earth Canada to see how worried people are about the issue and to see how much they know about bees. Canadians are concerned about the health of bees and blame pesticides for the dramatic deaths of bees over the last few years, according to a new poll. 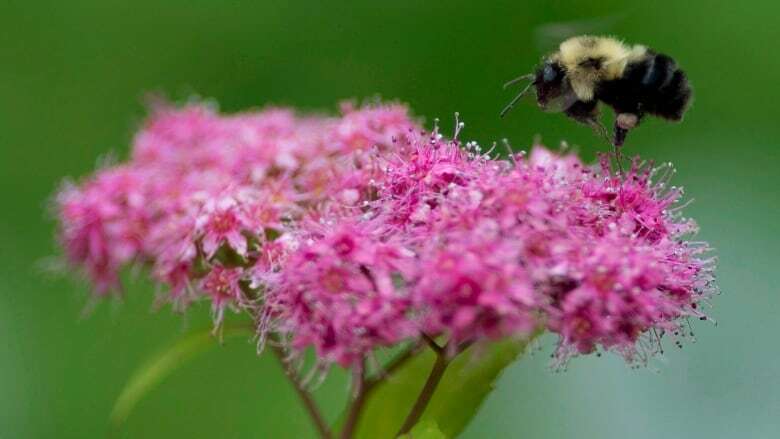 The survey, which was conducted on behalf of the environmental group Friends of the Earth Canada, suggests nearly seven in 10 Canadians are concerned or very concerned about the loss of the bee population. Nearly nine in 10 respondents to the survey, when read a list of possible threats to wild native bees, said they believed pesticides are the most important threat, followed by the loss of flowers and habitat, diseases and climate change. It is commonly held that bees are responsible for helping produce one of every three mouthfuls of food we eat by helping to pollinate plants, including those that produce most fruits, nuts and vegetables. Beatrice Olivastri, chief executive officer of Friends of the Earth, said she was surprised by the broad consensus among people from all regions of the country. "The poll numbers were pretty much even for urban and rural people," said Olivastri in an interview with CBC News. "The answers didn't surprise me as much as the fact as they were consistent among urban and rural, and if anything maybe a little stronger from young people, the millennials, rather than older people — say, 70-plus — so that kind of surprised me." Olivastri said the level of public engagement and interest has grown dramatically since beekeepers and environmental groups raised the alarm over the recent global honeybee die-off. Scientists still don't know the cause, but a growing number of studies show it could be a combination of disease and the widespread use of neonicotinoid pesticides. Health Canada is proposing a ban on the longest-used neonicotinoid pesticide called imidacloprid. A decision is expected by the end of this year. Four environmental groups, including Friends of the Earth, are also heading to court to get the government to stop licensing the use of two other neonicotinoid-based pesticides thought to be harmful to bees. "As an environmentalist for about 40 years now, I've never seen an issue that people gravitate to as saving the bees — it is remarkable the way people have picked this issue up," said Olivastri. The national survey was conducted by Oracle Poll Research by telephone using live operators between May 14 and May 24, 2017. The margin of error for the 2,000 people sampled is plus or minus 2.2 percentage points, 19 times out of 20. The poll suggests deep concern about bees, but also that Canadians don't know that much about them. 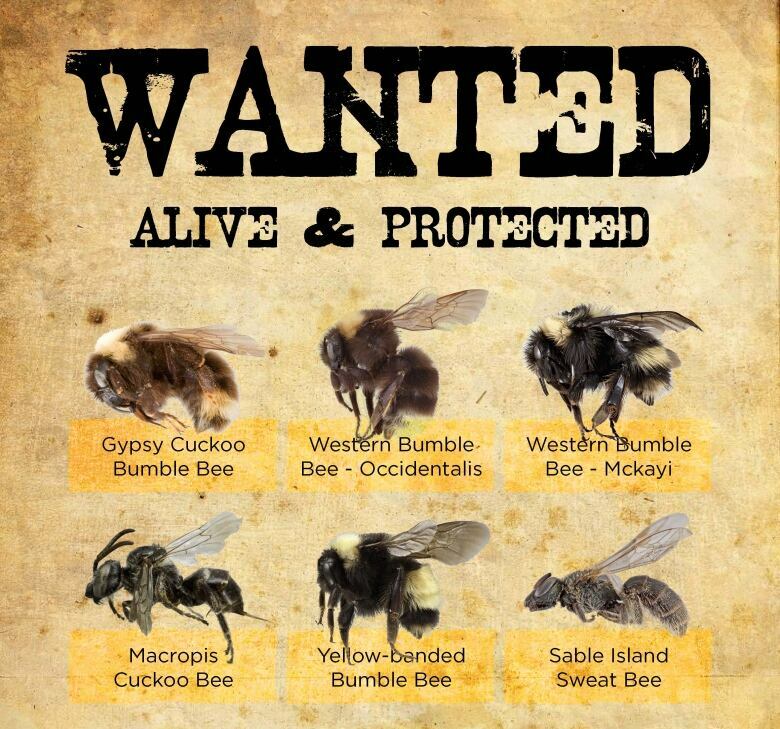 "We asked people to name wild native bees in Canada, and the first name was honeybees. Honeybees, we love them, but honeybees are from Europe, they are not wild native bees," said Olivastri. When asked if honeybees can replace native or wild bees in pollinating crops and wildflowers, 66 per cent of Canadians didn't know. There are 855 species of wild native bees in Canada, and they play a much bigger role in pollination than the honeybee does. "Who was pollinating for farmers earlier, before we had this commercial approach to producing honey?" said Olivastri. "It was the wild native bees, so we need them." Since 2011, scientists on the Committee on the Status of Endangered Wildlife in Canada have recommended that the federal government protect six disappearing species of wild bees. But a decision still hasn't been made about whether they should be added to the list of wildlife species at risk. A spokesperson for federal Environment Minister Catherine McKenna said the government is considering that right now. "Analysis is currently underway by Environment and Climate Change Canada to support consultations and a decision on whether to add these species to the list," said Marie-Pascale Des Rosiers. "We are putting words into action to protect Canada's wildlife by listening to our scientists and acting quickly to help threatened and endangered species." She said that the federal government is also spending $12.2 million a year on projects in the Habitat Stewardship Program designed to conserve and protect species at risk. The poll also suggests Canadians think that governments should be most responsible for the protection of wild bees. More than half surveyed — 51 per cent — said it was up to the federal and provincial governments. Another 23 per cent felt that pesticide manufacturers were most responsible.